Make a set of wired wings for your favourite fairy. These wings are a slightly more advanced version of 'Simple Wired Wings', and are sewn from semi-sheer fabric, and have wires inserted which slip into pockets sewn onto the back of the costume bodice. The tutorial covers the steps involved in making the wings for my 'Mini Topaz'. made. For MSD size wings use an 18 gauge. This tutorial includes the actual size wing patterns used for making my Mini Forest Fairy wings, as well as several other wing patterns you may want to try. 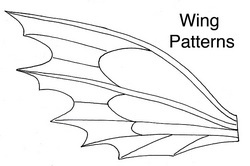 To download the pattern pdf click on the Wings Pattern Button below. 1. Print and cut out wing pattern. Pin pattern onto double layer sheer fabric. Trace upper edge of pattern onto fabric and cut with a 3/8" seam allowance along the top edge and leaving plenty of excess around the other outer edges of wing pattern. 2. Fold back body edge of wing fabric and sew along top edge of wing. the fabric from direct contact with the iron. onto fabric with pencil. Remove pattern from back of wing and re-pin fabric. the edge of the actual wing makes stitching to end of line and turning much easier. to clip ends of sewn vein lines. Draw a line of Fray Check along outer wing edge. Let Dry. wire back up tightly with pliers. About 1/4" below upper wire, bend second wire out below it. Measure along fabric wing, cut end and bend under the end of the wire to make a blunt end. two wire ends and pull fabric back over wires. Quickly stitch securely with needle and thread. 9. Tie off thread, and smooth any bumps of cooled glue with tip of hot glue gun. medium and dilute with water. Using a soft brush 'bleed' the base paint colours onto the wet wing. and zig-zag edges. Fold under all the edges and hand baste to hold. making sure to leave top edge open.